I pleased to introduce my guest blogger Roberta – a world traveler who just happens to be related to me by marriage. Blogger Hubby and I always enjoy seeing her and receiving her Christmas cards to read about where she has been during the year. It might have been all the cards that began my lust for traveling after hearing about all her adventures. Hope you enjoy reading what she has to say about OAT. My name is Roberta and I am Blogger Jane’s cousin-in-law as her Blogger husband is my first cousin. She asked me to share some of my impressions about Overseas Adventure Travel Company better known to all as OAT. I have traveled with them 44 times and my fiancé Joe 45 times. We both lost our spouses many years ago and luckily found each other, two people with a lust for life and love of travel. Not long after we met Joe informed me that for his vacation next year (1998) he had found a company that specialized in “adventure travel” and he was going to go on an African Safari with them. I was not invited as “we did not know each other well enough to share a tent” and I was also still teaching plus the trip had been booked months before we met. His month in Tanzania and Zanzibar was a life changing event and he couldn’t wait to take me there and every other place on his bucket list. We started traveling, slowly at first until we retired and then with a vengeance, having now visited over a hundred countries many more than once. 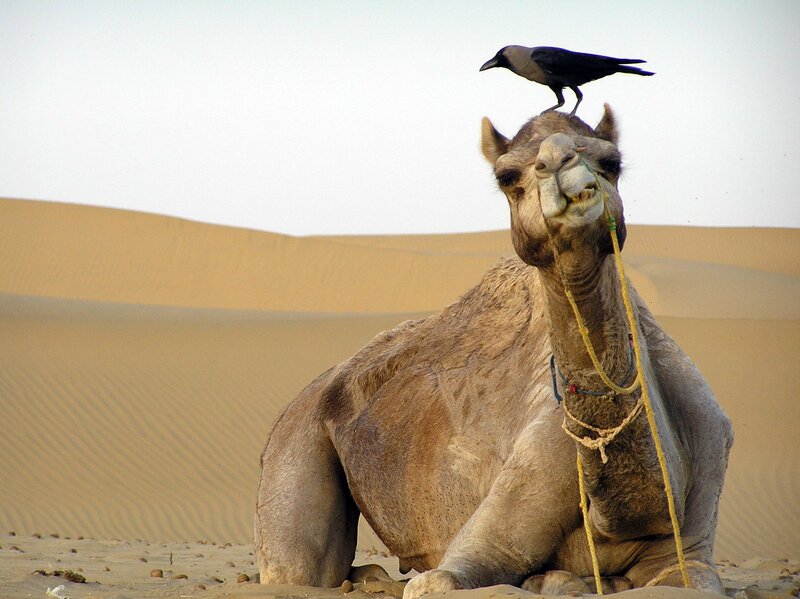 OAT became our travel company of choice because their trips are an excellent value, their Tour Leaders are top notch, they want to show you a country up close and personal warts and all and the places you stay, foods you eat and things you do are all cultural experiences and adventures. The people you meet in this small group travel company (land tours have a maximum of 16 guests) are just an added bonus. 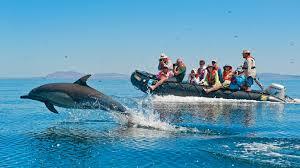 You do not simply get on and off the bus, you take rides in rickshaws, in canoes, on camels and horses, you hike in the jungle, you climb sand dunes, your Zodiacs take you to see the penguins in Antarctica and have leopards and lions walk so close to the vehicle you could touch them. Obviously our list of OAT trips is too long to complete but some of our favorites have been SAFARI SERENGETI (6 times for me 7 for Joe and every adventure was different even though we were in the same country), Morocco, China, Thailand, Italy, Bhutan, Vietnam, Namibia, South Africa, Japan, Turkey and Myanmar are just a few. Overseas Adventure Travel has changed since we have traveled with them both in good ways and some we haven’t liked. One excellent change this year is to include the tips required for everyone except your Tour Leader in the cost of the trip. This has been one area that the post trip evaluation forms kept emphasizing as something that needed to be done by the company. Another change that we found “troublesome” is the price for the airport transfer if you book your own air. We feel that they are extraordinarily high since the “bus is heading there” anyway and today if you are interested in accumulating air miles the airlines will not give them for third party ticketing or consolidation fares. 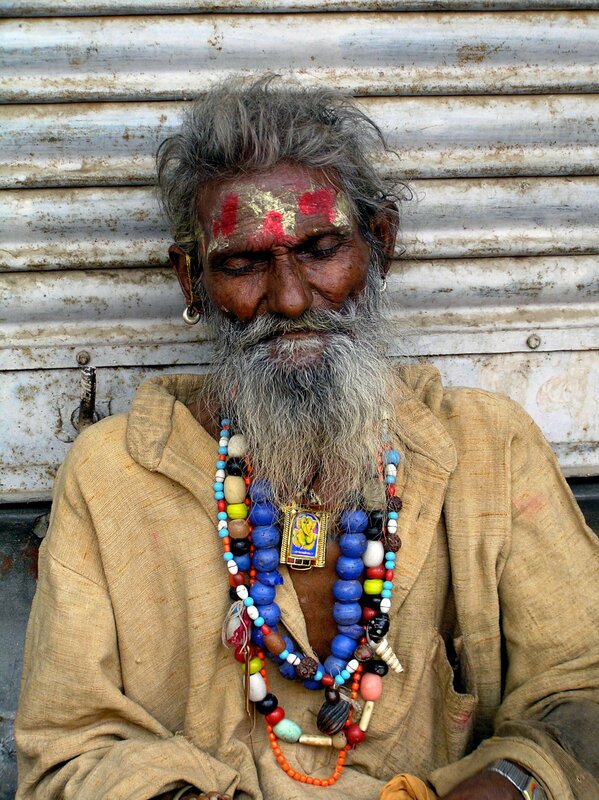 In order to keep prices down we have seen a decline in the quality of properties OAT uses for their accommodations. They are always clean, often hotels reflecting the culture and/or unusual in some way but they are definitely not what they used to be when we started traveling with OAT. The company does an excellent job of getting travelers up close and personal with people in the country where you are by school and orphanage visits, home-hosted meals and sometimes an overnight stay and trips thru local markets and villages. These are wonderful ways to really get a feeling for what it would be like to live in this country. The Tour Leader is a citizen of the country he is representing and shares his or her knowledge and love of country with you and/or the problems there as they see it. No topic is off limits to questioning. We have traveled with many other companies but I would say OAT has a very good product if you prefer small group travel and you are physically able to take a little more adventurous trip. You will not be required to lug your gear or climb Mount Everest but you will have fun! Thank you Roberta for your perspective of traveling in a small group with a tour guide. I think what I took away from this is the difference between OAT and other tour companies in that you are welcomed into the lives and culture of the people of the land that you are visiting. 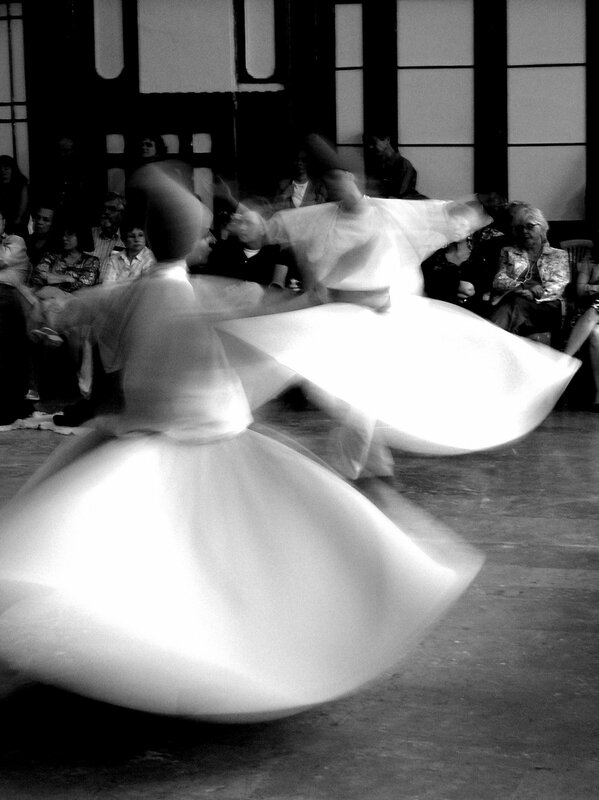 A more intimate visit than just wandering the streets. A Gift for Travel Photographers – or for yourself! I don’t know if you are anything like me but sometimes I don’t like gift giving. I guess I should qualify that statement and say that I really do love giving gifts. I love seeing the joy when a gift is a hit, the excitement of something random that is just what they want. This is what gift giving should be like but most times it’s not – it tends to be a nice gift. Most times I stress too much about what to buy, is it something they want, does it fit their style, does it fit, etc, etc, etc. This year I found the PERFECT gift for our son. Here is the story about the gift – now stay with me because you may like this gift as well. Blogger Son #1 has a great eye for photography. He is our family photographer photographing the babies that have come into our family, engagement photos, candid wedding photos, and all family gatherings. He has been in art shows with his photographs, he is a published photographer for two cookbooks and wrote a travel blog about his travels around the world told in part through his photographs. 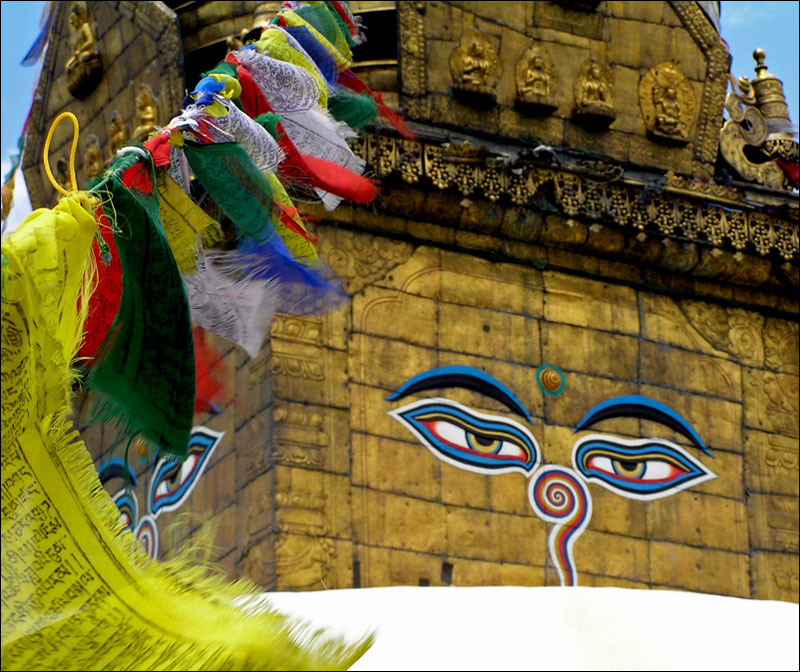 When you think of travel photographs what do you think of? For me I think of all the beautiful photographs that the National Geographic photographers have taken to grace their articles and magazines. Many people have commented to Blogger Son #1 and to me that he should submit some of the photos to Nat Geo but he hasn’t yet. I read on the National Geographic website that they have seminars for amateur photographers. They have half day, full day and a weekend long seminar this year. They offered different themes in different locations around the country. Some of the themes that they offered are Creative Travel Photography, Adventure Travel Photography, Nature and Landscape, People and Cultures, Photographic Eye, Storytelling Photography, and stories from actual National Geographic Photographers telling the stories of how they were able to capture some of those images which we are all familiar with that have been on the covers and pages of National Geographic. Knowing this and seeing where the locations were made my Christmas giving easier for me and a great gift for our son – there was even one in the city that he lives in! We typed up a certificate offering him either two half day seminars or one full day seminar. If he decided to travel to go to these seminars, then he would be responsible for the travel. Each seminar has a different photography focus and I wanted him to find the one that best suited his needs. He chose “Creative Travel Photography”. If you want to give a gift of photography or if you would like to improve your photographic skills or take them to a different level, please go to this link for National Geographic and find the seminar that holds your interest. Here are a few of the pictures that he has taken during someof his travels. I hope you enjoy them and if you want to look at more or perhaps purchase some, please go to this website. Our last stop on our eleven night cruise was at Puerto Limon in Costa Rica. This was the only port that had a number of local vendors right at the docks in a huge tent. I imagine that there is some government involvement as to who is actually selling their wares as all the vendors are wearing the same “uniform”. Also in the tent you can get a pedicure, manicure and massage. I’ve had a pedicure here twice! Our day in Costa Rica dawned early and brightly. 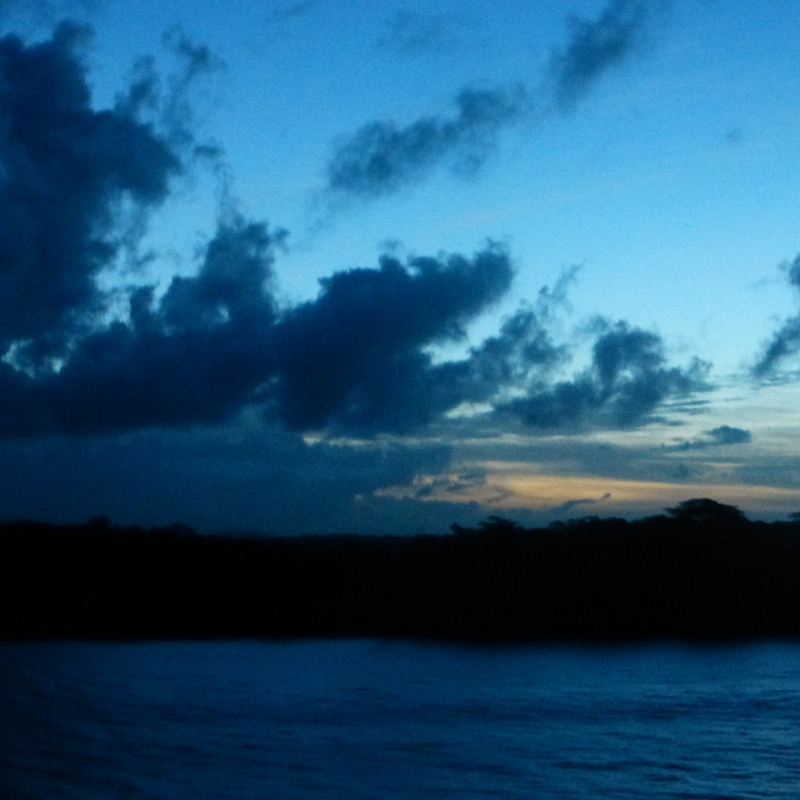 The sun rose as we pulled into port at Puerto Limon (San Jose) on Tuesday, Jan. 20, 2015. After a brief rain shower, the sun came out and the temperatures were warm. It was not nearly as humid as it had been in Panama. I was up early, excited to see a new place. I had already packed my day bag with bottles of water, a hat, sunscreen, a few snacks, camera, binoculars and bug spray (which had been recommended.) Those going ashore on HAL excursions gathered in the Vista Lounge and waited to be called by group. The cruise line offered quite a variety of day trips, as we were going to be in port for a long day. 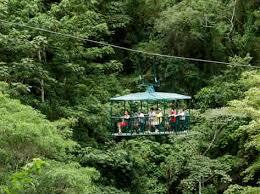 I chose the Rain Forest Aerial Tram trip, which lasted over seven hours, for $124.95. We boarded a comfortable, air-conditioned bus right at the dock. Our guide Dennis was quite personable and knowledgeable. As we passed banana groves, pineapple fields, coffee plantations and views of the fog-covered semi-active volcano ranges; he gave us many facts about what we were seeing. Our driver Freddie did a wonderful job of navigating the potholes, truck traffic and narrow sections of road. Rain overnight and that morning had caused landslides in several areas. Our drive to the rain forest took almost two hours, but we were allowed to pass traffic on the “wrong” side of the road in order to meet our appointed time there. A baby sloth was spotted in one of the coconut palms, so we pulled over to watch it hang upside down. Costa Rica is known world-wide for its progressive environmental policies and sustainability, and has a high literacy rate. The government has announced a goal for it to become the world’s first carbon-neutral country. The Rainforest Adventures Atlantic activities can be found at www.rainforestadventure.com. It received Trip Advisor’s Certificate of Excellence. Its property borders Braulio Carrillo National Park. Our bus of forty passengers was divided into two groups upon arrival. Half the group went on a 20-25 minute walk with Manuel, an enthusiastic guide. The path was clean, packed dirt or concrete with slight elevation changes. He stopped often to discuss the floor and sub-canopy species of plants. We heard many birds, and saw evidence of travel through the area by animals (most of whom are nocturnal.) If you did not want to walk; there was a shaded, covered area with benches to wait. There was also an air-conditioned gift shop with bathrooms conveniently nearby. When we returned, we climbed aboard a seven person gondola for a 70-75 minute excursion through the canopy of the rain forest. 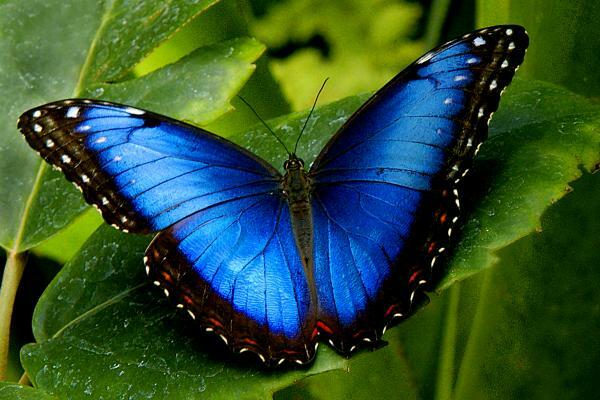 Our guide Damien was thrilled to be able to show us several birds and butterflies, including the beautiful blue Morpho. The tram runs in two directions, one higher and one lower, so you actually see different layers of the rain forest. He pointed out and explained many different plants, bushes and trees at each level. A wonderful typical Costa Rican lunch awaited us on the patio. We had been encouraged to try to mixed guava/papaya juice and the white soursop drink, both of which were delicious. Buffet choices included chicken, rice, black beans, fresh fruit, salad and warm plantains. As we awaited our shuttle bus back to the parking lot, a sloth and baby snake were spotted. What fun to watch the sloth right over our heads. On our return bus ride, a pineapple, banana bunch and large cacao bean were passed around the bus. Trivia questions were asked and answered by our guide. Then Dennis came to each set of seats with a map of Costa Rica to orient us, and answer any further questions we might have. We were the last bus back to the ship, after a very informative day. 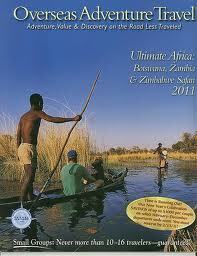 I would highly recommend this excursion, and would love to return here to try the zip line and stay in the lodge! Thank you for detailing your day and your excursion into the rain forest of Costa Rica. 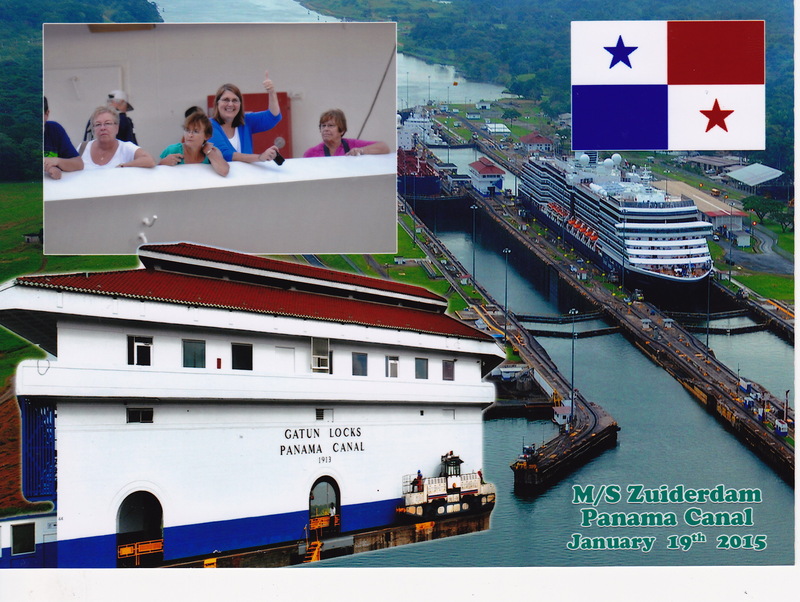 This post was written by Blogger Friend Deb who was on the Panama Canal cruise with me. She and I both did different tours while in the Canal. 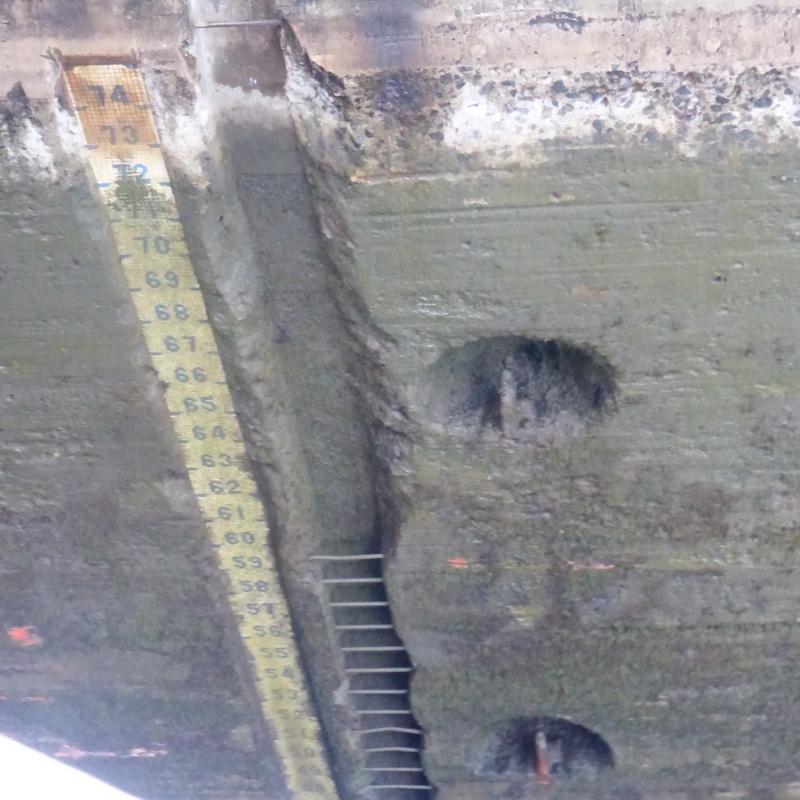 Here is her account of the ferry ride through the canal and the locks that they went through. If you are only doing the partial transit of the canal on the cruise ship, I would recommend doing the rest of the canal on the ferry boat excursion (Canal Experience to Colon on Holland America ). Make sure you take binoculars, a hat, sunscreen, and wear cool and comfortable clothes. Water and other cold drinks are provided on the ferry boat, as well as a lunch of finger foods, small sandwiches, pasta salad, fruit, and a muffin. There was ample food and not difficult to carry to any place on the boat to eat. 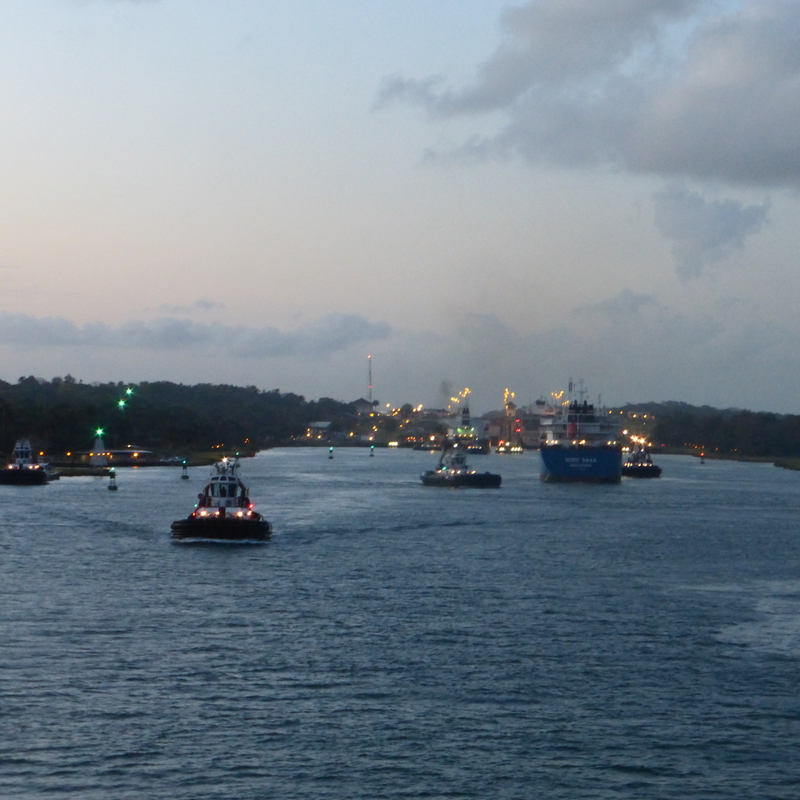 We went ashore by tender in Lake Gatun after exiting the Gatun Locks. After a bus ride of about an hour or so to Gamboa, mostly on an expressway, we boarded the ferry, which was fully loaded. We were some of the last people on, and had to take seats on the top deck at the back and in the sun. I first thought we’d be stuck there all day, but once people stopped saving seats and staking out their territory, they began milling around, talking and meeting new people, it was not a problem. We got to see everything up close and personal and more down at eye level and on a different perspective than on the cruise ship. 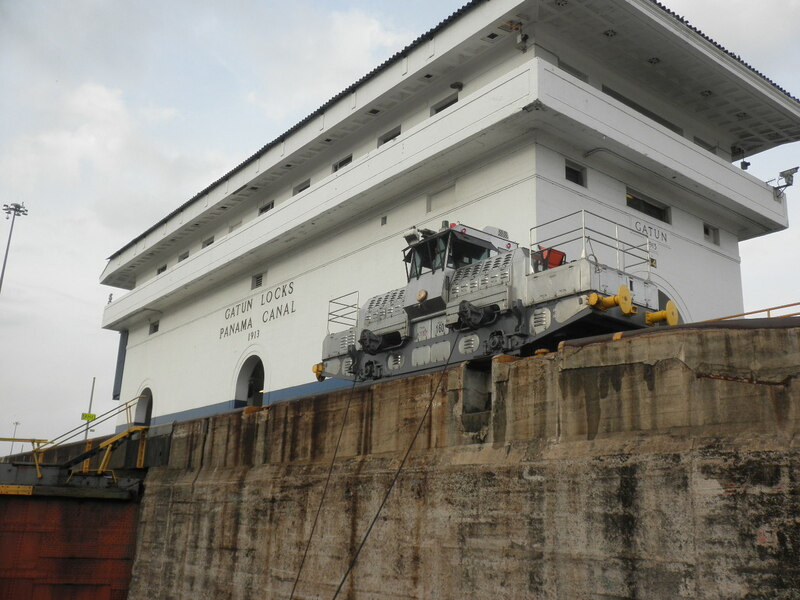 From Gamboa, we left Lake Gatun and went through the Culebra Cut past Gold Hill and under the Centennial Bridge to the Pablo Miguel Locks. 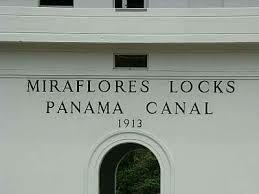 Passing through the Pablo Miguel and Miraflores Locks, we were right up against the sides where we took pictures of each other touching the slimy green walls of the locks. Great fun! Exiting the Miraflores Locks, the trip continues past Balboa and under the Bridge of the Americas where we disembarked near Panama City. 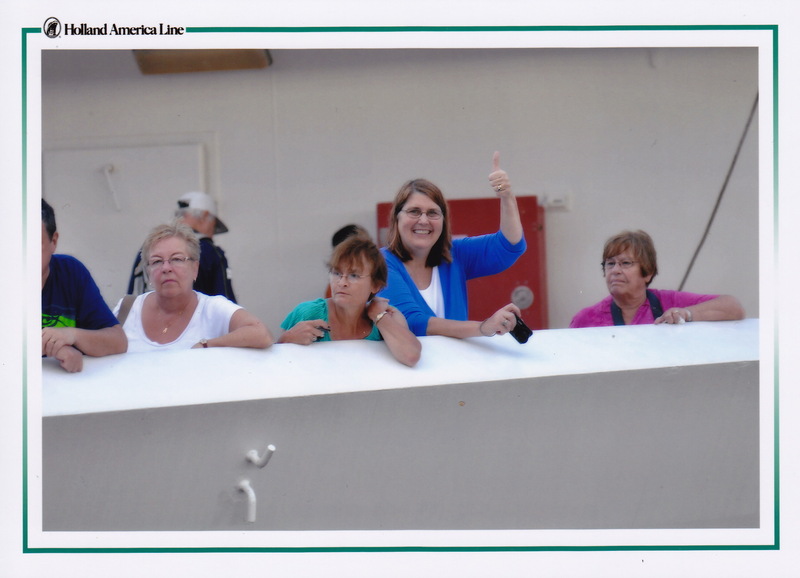 We were able to move around the ferry and even ended up at the very front of the boat with good seats. There were adequate toilet facilities on the ferry. It only got crowded again when we were close to getting off the boat at the Pacific end, and everyone crowded the stairs. We were bused through the out skirts of Panama City and then about an hour by expressway back to the Caribbean side where we re-boarded the cruise ship at Colon. The cost of the excursion was not cheap at about $170 each, but when you consider that we had a bus ride each way, a meal on the boat, and the boat had to pay a substantial fee to the Canal to transport through, it was probably not unreasonable. We thought it was well worth it to go through the whole canal, something we would do only once in a lifetime. 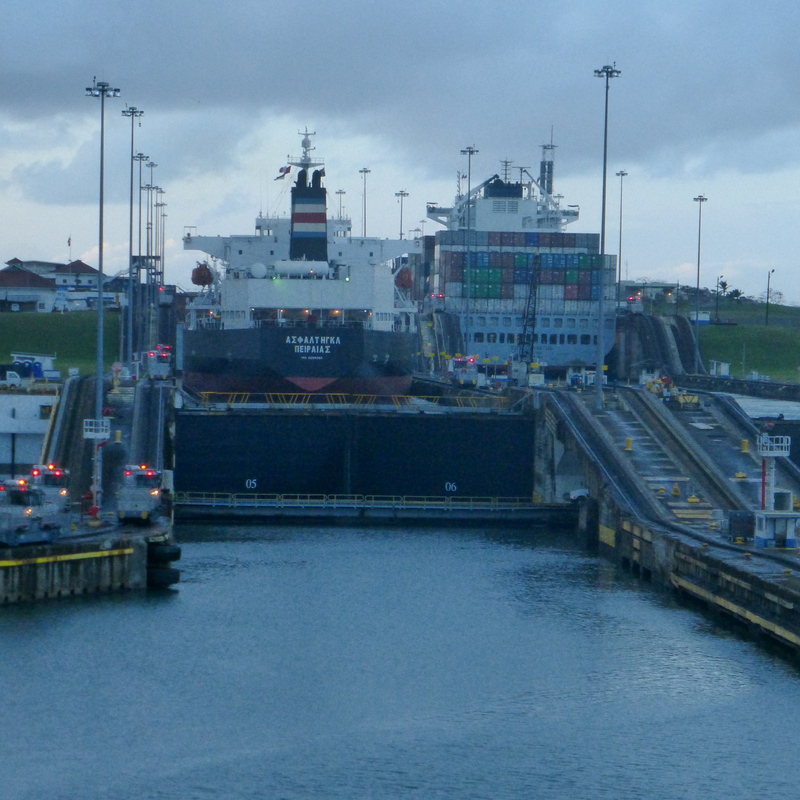 Excitement was building the night before we were to sail into the Panama Canal. We were all asking each other what time we would be up in the morning and wondering how long it would take to go through the locks. We actually went to bed somewhat early as I had set my alarm to 5:00 AM (yes, you are reading that correctly). I had been on this cruise before and “knew” a few things that would be happening as we got close to the entrance to the Canal. We were notified that the ship would be opening up access to the bow on the 4th deck for our viewing pleasure at 6 AM. When we cruised last, we were there at 6 AM but it was already filled with people lining the rails. 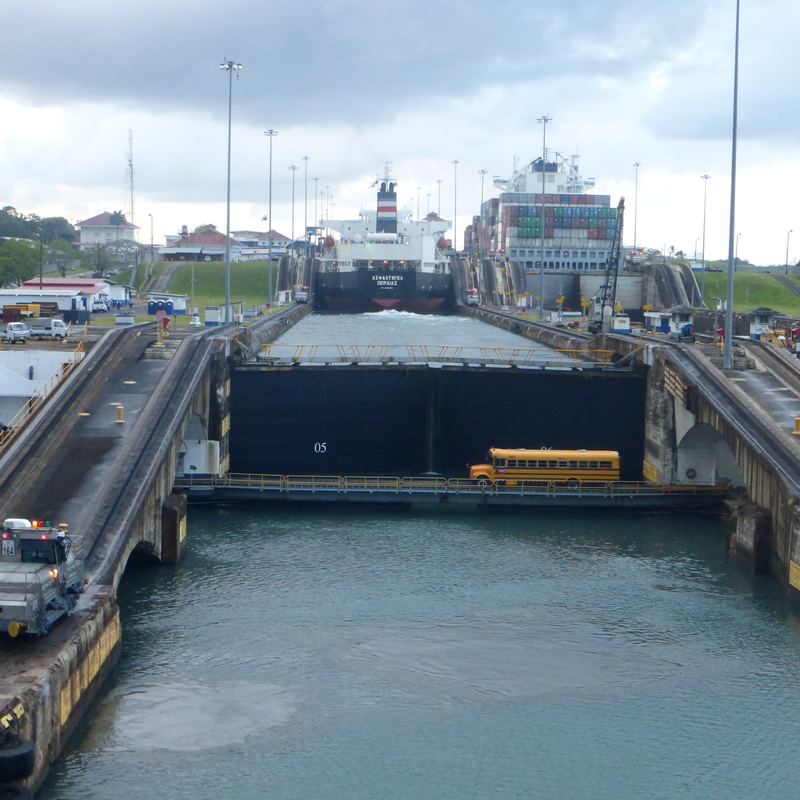 I was not going to make the same mistake a second time – I wanted to be at the rails to get a good view of going through the locks and seeing the lines on the wall on the canal as water entered to lift us up to sail through the Gatun Locks. The alarm went off and although I it was really early we left our room and was out on the bow at 5:20 AM. It was BLACK outside – not even dusky but pitch black. We did find a few spots along the rail and watched the few lights along the shore. We were able to watch the sun rise over the Pacific (that is not a mistake – due to the curve of the Isthmus of Panama and that the canal runs in a north and south direction the sun rises over the Pacific and sets over the Atlantic ( Wikipedia explains it better than me). 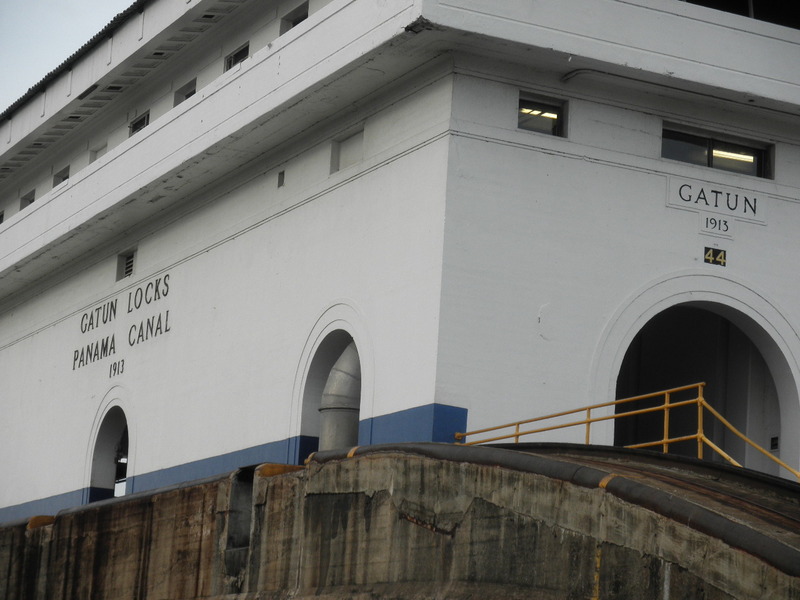 As we watched the gates open for our passage, we could see the water from Gatun Lake, the largest man-made lake ever, fill up the chamber of the lock. Numbers are written on the wall of the locks for us to see it filling up. 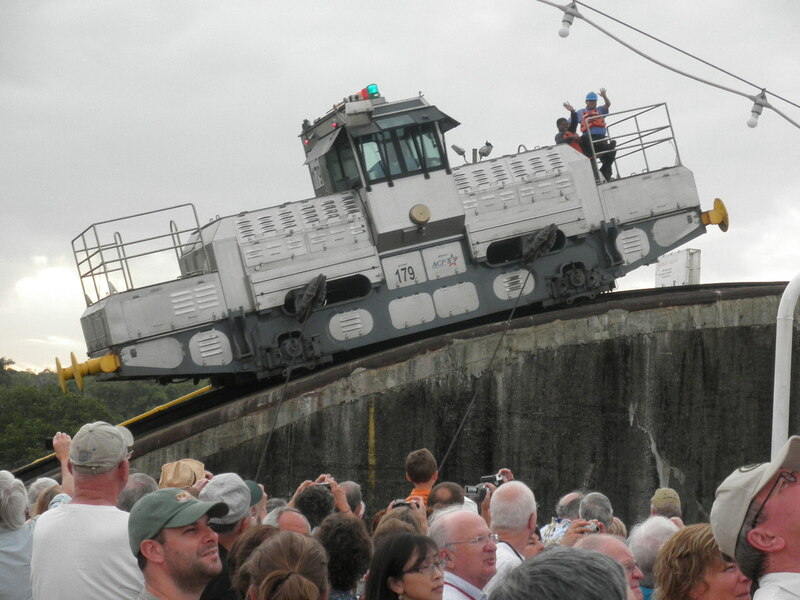 The ship was tied to the electric towing locomotives on either side of the canal in order to pull the large ships through the canal straight. There isn’t much wiggle room for the large ships. 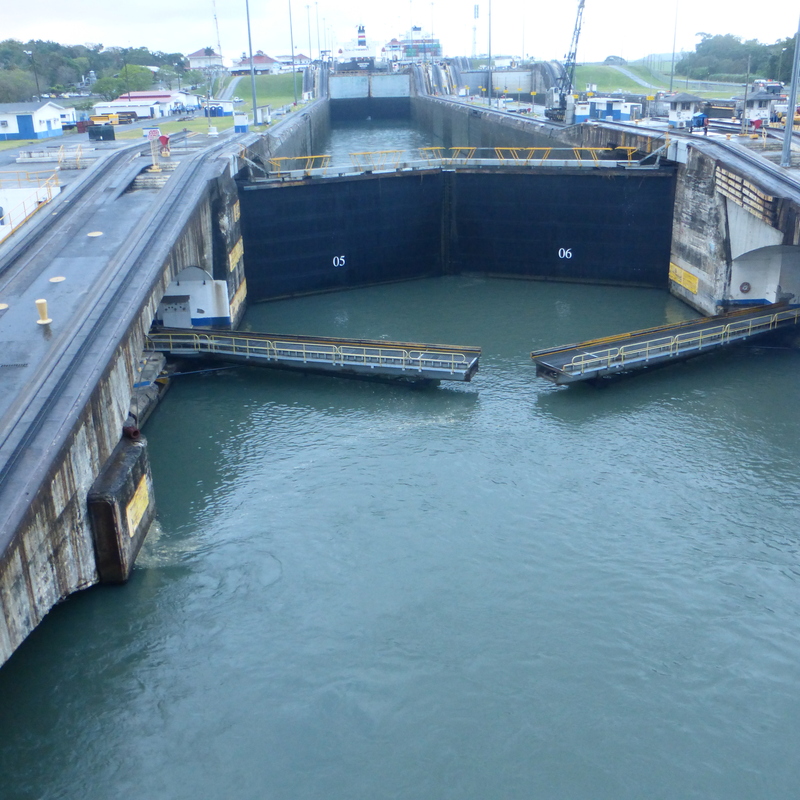 After our chamber filled up with water, the gate opened and we sailed out to Gatun Lake. From this spot on Gatun Lake, those of us who were taking an excursion were tendered to shore. The Vista Lounge was the staging area for the excursions. By now it was 9:15 AM, we had been up for 4 hours and still a long day in front of us. I had my backpack with a deck of cards, bottles water, snacks that I packed from the buffet breakfast in my ziplock bags that I had brought from home and some cash in case I wanted to purchase souvenirs. Blogger Friend Susan and I took the Panama Railroad to the Miraflores Locks and Observation Tower (this will be in a future blog) and Blogger Friend Deb took the ferry boat ride to the other end of the canal. She has written about her experience and you can read that later this week. So many adventures, so little time. Enjoy some of my pictures from the morning. As my friends would say, I’m always thinking about ways to earn more points especially if I do not have to spend any money in doing so. For those new readers of mine who are not familiar with manufactured spending it is spending to meet your minimum spend on a new credit card and/or a way in which to accumulate additional miles/cash back. There are many different methods to manufacture spending, but the end goal is all the same. You are “spending” money by using your credit card and then later getting back the dollars spent in the most cost efficient way possible. To see an example, go to this link to read about the Redbird. Now most of you who cruise and are aware of manufactured spend may be scratching your head to see how I was able to manufacture points on my recent cruise. Let me begin by telling everyone that when you cruise you either need to register a credit card for your onboard expenses or put down a set amount of money. We always give them a credit card number to use for those expenses – no need to keep track of what we have spent and if we’l run out of money that we put down for the cash deposit. For this cruise I used a credit card that I had only received the week previous and I knew that I needed to meet my minimum spend. Since it was a Citi card doing the Redbird method at Target was not going to work as Citibank codes the loading of my Redbird as a cash advance but I was curious if my new way would work. On most cruise ships there is a casino and in the casino you can either feed those hungry machines with cash OR you can charge a certain amount of cash to your Ship to Shore card which is your stateroom account. Let me explain this in a little more detail so you’ll understand. If I decide to play the slots, I would put some money in and after I win, change does not come out of the machine but rather it shows on the slot machine itself. After I’ve played for a little bit, I might decide to quit or to move on to a different machine. When I push the “Cash out” button there is not clanging of coins into the tray nor is there a paper ticket to insert in another machine. What I have to do is to cash out to my card. When I move to a different machine I can then punch in my “PIN and transfer some money from my card to the new slot machine. Another method to begin to play is to push another button and to charge money to go on your Ship to Shore card. You are not putting any physical cash in the slot but rather charging your slot money to your card. There is no fee to do this from the casino or from the cruise line. 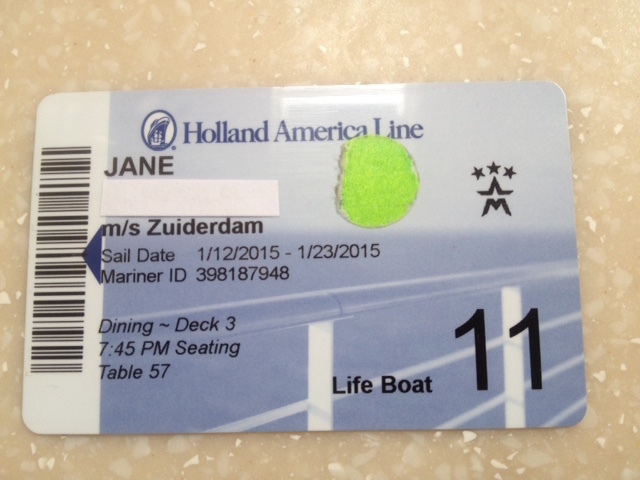 For purposes of clarification, I was on Holland America but I believe it works on all cruise lines this way. I would then charge $300 to my account. At the end of the evening, I would take my Ship to Shore card that it was charged onto to the cashier in the casino and cash out. I collected all my money that was left after playing. I did this for several nights and came home with cash. Once I arrived home I deposited the cash into my checking account to use to pay my credit card where the charge for the cash would show up. Looking at my statement from Citibank, the casino charge is bundled with other items that I charged on my Ship to Shore. It was all coded under General Purchase. This sounds much more complicated than it is but trust me, it is quite easy. The only trick is to not use the cash that you need to deposit back into your checking account either in the casino or elsewhere. Now I realize that we can’t go on a cruise every week, at much as we would like to, but if you are on one this is a way to manufacture points while you are sailing the high seas. I believe that you can charge about $2000 per day to your ship account. An easy way to manufacture spend for points and/or a minimum spend for a new credit card. Have you ever done this or thought about it?